St. John Neumann Regional Catholic School maintains a rigorous middle school curriculum that meets and exceeds state and national social studies standards. Middle school religion is a three-year journey to further help students develop a deep relationship with the Father, Son, and Holy Spirit through the exploration and study of 1) sacred scripture, 2) Church doctrine and 3) Catholic dogma. Students become strong advocates for their spiritual beliefs and develop a strong moral conscience. Through stewardship, field trips and retreats, middle school students take their beliefs and teachings and apply them to social injustices, diverse cultural differences, and those in troubled positions. Students are expected to respond to the Gospel call by engaging in community service through their time, talent and treasure. Middle school religion follows a curriculum that is developed by the Archdiocese of Atlanta. Students graduating from St. John Neumann leave with a strong sense of self because of their understanding that the human need for God is based on divine revelation and faith. SJN graduates are ready to take their place in the high school setting having a basic understanding of the Church and knowledge of how to participate in Catholic traditions and prayer. Service Project: “Help the Homeless” – Students sponsor a school-wide collection of travel-sized toiletries for the homeless serviced by Clyde’s Kitchen (Crossroads Ministry). They organize the toiletries into individual gift bags to be distributed to the homeless. Retreat: “Our Journey to God” – Students are actively involved in learning the journey of the Old Testament figures and applying the lessons learned to their own lives. Service Project: “Birthright Project” – Students create gift bags for expectant mothers serviced by Birthright. They work in conjunction with Kindergarten families who donate many of the items for the gift bags. Students also make baby blankets for Birthright at their retreat. Retreat: “The Works of Mercy” – Students are actively involved in learning and living the Spiritual and Corporal Works of Mercy, to be the hands and feet of Christ in the world. Students make baby blankets for Birthright during the retreat to support their Service Project. Service Project: “Feeding the Poor” – Students conduct a school-wide fresh fruit collection 4 times each year to take to Clyde’s Kitchen, where students rotate going there to prepare and serve lunch to the poor of downtown Atlanta. Retreat: “Field Trip to St. John Chrysostom Melkite Catholic Church”, Atlanta, Georgia. Students will learn about this Eastern Orthodox tradition of the Catholic Church, and how the Roman Catholic Church embraces this sect of Catholicism. Language Arts encompasses the areas of literature, reading, speaking skills, grammar, vocabulary development, and spelling. Middle school students continue to develop an appreciation of written and spoken language. Writing skills are emphasized throughout the curriculum, especially helping students to respond to what they read, and to develop their own creativity. The Language Arts curriculum focuses on two interrelated areas of study: Literature/Writing and English Grammar/Vocabulary. In Literature, students acquire and expand reading skills through exposure to a variety of informational and fictional texts. By reading a variety of genres, students learn to recognize the elements of literature and literary devices. Class novels are selected for literary merit, cross-curricular connections, and the opportunity to introduce the Principles of Catholic Social Teaching. Each grade level reads at least three novels in class and uses a program where students choose their own reading materials to explore different genres through conferences, reviews, blogs, etc. with their teacher and other students. In writing, students create and develop formal and informal pieces of writing. In Vocabulary, students continue to expand both spoken and written vocabulary and increase their knowledge of correct spelling. In English grammar, students acquire a background in the conventions, usage, and mechanics of oral and written language. All middle school grades participate in the Archdiocesan Spelling Bee and Civic Oration contest. In addition,`middle school attends live performances both in school and as field trips. 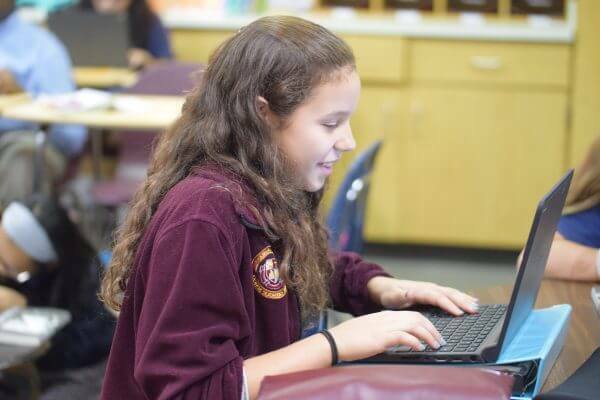 SJN works to meet all students and raise them to new heights with a rigorous middle school mathematics curriculum that is designed to meet and exceed state and national standards. SJN works to incorporate problem-solving skills, collaboration, and thoughtful explanations into the mathematics classroom to strengthen conceptual and procedural learning. SJN utilizes many digital and tangible resources to aid in student learning and reasoning skills. Problems are presented in unique ways to encourage students to think beyond the classroom setting and seek to apply these skills to their lives. Real-world applications and explanations are used to help students reflect on how real life can be modeled through mathematics. All mathematics sequences are integrated with mathematical communication skills, problem-solving skills, applications of technology, and creating meaningful connections with the content. SJNRCS overlays its curriculum atop the aggressive Next Generation Science Standards–national standards endorsed by the National Science Teachers Association. We couple classroom instruction with weekly labs and hands-on activities such that students integrate theory with real-world applications. The school’s one-to-one student-device program allows students to participate in virtual labs and explores interactive simulations. Students receive traditional science books, as well as access to the online textbooks to meet the needs of different learning styles. 6th Grade: The Earth & Space Science curriculum has students exploring science through three sequences: 1) Earth’s Place in the Universe, 2) Earth’s Systems, and 3) Earth and Human Activities. 7th Grade: The Life Science curriculum has students exploring science through four sequences: 1) Molecules to Organisms, 2) Interactions, Energy, and Relationships in Ecosystems, 3) Heredity, and 4) Biological Evolution. Students participate in several dissections, culminating in the dissection of a sheep heart to study the cardiovascular system. 8th Grade: The Physical Science curriculum has students exploring chemistry and physics through four sequences: 1) Matter and Its Interactions, 2) Motion and Stability, 3) Energy, and 4) Waves and Their Applications in Technology Information Transfer. This year is packed with many advanced science labs–assisting in the transition to high school. All science sequences are equipped with engineering design performance expectations. Our goal is to create well-rounded and knowledgeable global citizens while integrating our Catholic faith and values. Students have the opportunity to learn about other cultures through the curriculum and through one another. Students also have the opportunity to participate, in conjunction with math class, in a statewide competition called the Stock Market Game which teaches students global awareness and personal finance. Students receive traditional Social Studies books, as well as access to the online textbooks for a choice of learning style. 6th grade: The curriculum focuses on Europe, Latin America, and Canada through history, civics and government, Geography, and Economics systems. 7th grade: The curriculum focuses on the history of the United States from Early Americans to 1865 (Reconstruction), U.S. civics and government, U.S. Geography, and U.S. Economics. 8th grade: The curriculum focuses on the history of the United States from 1865 (Reconstruction) to the present day, U.S. and Georgia civics and government, Georgia Geography, and Georgia Economics. The school’s one-to-one student-device program is incredibly beneficial for monitoring student growth, creating academic presentations, and demonstrating mastery in unique and meaningful ways. It allows students to participate in collaborative projects, with their peers, to solidify learning. Students are able to have discussions with one another and respond to current events using various technological tools. A major tool we use is Google Classroom. This platform allows communication for the teacher to students and student to student to ensure correct learning and understanding. We also use Seesaw which allows parents to see what their child is learning through student-created products. Becoming more independent is something all middle schoolers enjoy, starting in 6th-grade when they get their first locker to the overnight retreat in 8th-grade. A progress report and report card are issued four times during the year at the middle and end of each quarter respectively to inform parents of their child's progress. Finals are given at the end of 2nd and 4th quarters. Also, weekly grades are available on the RenWeb Parents Portal.